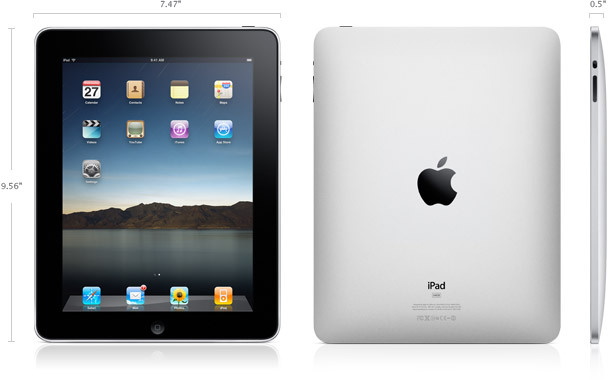 Unless you’ve been living in a box today, you know that Apple finally unveiled the tablet iPad today. The biggest surprise about the announcement was the lack of a camera on the lap sized PC. No camera, really? If you don’t believe it, check the official spec page. Besides the implications for augmented reality, which I’ll get to in a moment, the iPad not having a camera is a giant fail. I actually expected the iPad to have two cameras. One forward-looking so the iPad could function as a giant Polaroid and the other user-facing so videos could be recorded. We could forgive eliminating one of them, probably the forward-looking one since its so big, but not having the user-facing camera is inexcusable. The series of tubes we call the Internet has moved beyond simple text. People want to record and upload videos straight to YouTube without having to yank out their dust-covered hand held or use Skype to call their friends while they’re watching the game. The Apple iPad not having even one camera is like hooking up satellite without DVR. Sure you can do it, but why? Of course, I’m being overly melodramatic here. The real point to the iPad is competition for the Kindle, eReader and the Nook. Apple wants to revolutionize the way we read magazines, books and newspapers. Functionality for augmented reality isn’t even an afterthought. How many people are using their camera lying in bed reading an interactive book? And is this a major setback for augmented reality? Not really. A giant-sized magic lens would add a fun new canvas to play with, but really wouldn’t be a game changer. Additionally, Apple isn’t expecting the tablet market to come even close to the smartphone market in sales. So in the end, the iPad is a fail for augmented reality, but will probably give Jeff Bezos nightmares for months as he wonders how he’s going to compete against a Pentium 286 when he’s selling a Commodore 64. And maybe, just maybe, Steve Jobs is still working on a see-through AR-enabled HMD. Then I’d say, all is forgiven Stevie, I’m coming home to Apple.